We’d love your help. Let us know what’s wrong with this preview of The Fire Dancer by Kristen Strassel. Brought to Las Vegas as vampire bait, Holly’s connection to the immortals is a mystery. She’s one of a kind-- traveling through time and igniting when her emotions get too hot to handle. The only At Le Cirque Macabre, Holly Octane bursts into flames five nights a week. The stage is where Holly feels most alive. When she’s there no one can touch her, and everyone adores her. Brought to Las Vegas as vampire bait, Holly’s connection to the immortals is a mystery. She’s one of a kind-- traveling through time and igniting when her emotions get too hot to handle. The only people who understand her are an aunt with a hidden agenda and her fortune teller girlfriend, Rainey, who doesn’t see a future with Holly in it. Cash Logan needs Holly, but she’s not the reason he came to Vegas. The enigmatic magician seeks Blade Bennett, a vampire that has a power that he shouldn’t have--fire. A power that could determine the future of all of vampire kind. Holly’s the only one who can help Blade control his fire, but their feelings for each other are too fiery to ignore. To ask other readers questions about The Fire Dancer, please sign up. This was an interesting supernatural story. There are vampires and other magical beings that live out in the open in the human world. Our story takes place in Sin City itself, with Holly as The Fire Dancer showgirl in Vegas. She does not know much about herself, and this story delves into her learning about her background while trying navigate her complicated life. I will admit that about half the time I loathed Holly. She seemed to flip-flop between love interests, and even which side she was on. Holly was also rather whiny at points. But ultimately, with the help of others, she turned out to be rather badass. Actually, I loved the story line in this novel more than any of the characters. Don't get me wrong, the characters were phenomenal. But Holly took center stage and the other characters seemed to be in the background far too much. I like equality when it comes to characters but again, they were good. This novel ended in a semi cliff-hangar, leaving me wanting more. So I can't wait to find out what's in store. This is the first book by Kristen Strassel I have had the opportunity to read and I must say I am absolutely hooked. The Fire Dancer at first I was a little unsure of where the story was going to go, I am a huge paranormal story fan but this one definitely was outside your norm (in a good way). Holly is a performer in Las Vegas and she has had a rough time of it, she lost her parents when she was younger, she has her best friend but she is an outcast and doesn't have any other friends. Lucille t This is the first book by Kristen Strassel I have had the opportunity to read and I must say I am absolutely hooked. The Fire Dancer at first I was a little unsure of where the story was going to go, I am a huge paranormal story fan but this one definitely was outside your norm (in a good way). Holly is a performer in Las Vegas and she has had a rough time of it, she lost her parents when she was younger, she has her best friend but she is an outcast and doesn't have any other friends. Lucille the lady that she stays with is not very nice to her and honestly the poor girl just seems to struggle. Well that all changes when a Vampire named Cash walks into her life and takes over the show she is the star of when this happens I have to tell you this is when the stuff really hits the fan!! This story line absolutely gets so incredibly fantastic that I could not put this book down it was so full of action, drama, suspense some amazing chemistry between Blade and Holly, some incredibly tender moments as well. Blade since I didn't mention him earlier is a vampire that also can control fire like Holly thats all I'm going to give you though because I don't want to spoil the book :) Holly has some revelations a lot of information that she finds out about her family that she didn't know before but I have to say the odds are really stacked against both Holly and Blade. Kristen Stassel does such a great job of creating such complex characters and creating that connection between the characters and the readers so that the reader really feels like they are going on the journey along with them. I cannot wait to see where Kristen takes us in the next book when she continues Holly's story. Holly is The Fire Dancer, she has no idea where the talent came from, but it puts on a darn good show. Until Cash enters her life, she has no idea what she is or where she came from. But Cash is a vampire, and vampires are dangerous. When Cash asks for Holly's help with another vampire, Blade, who has the same talent, Holly's life spirals downwards. This is, I believe, a spin off from another series. One I've not read. I do wonder if I sh Independent reviewer for Archaeolibrarian I Dig Good Books. This is, I believe, a spin off from another series. One I've not read. I do wonder if I should have read those books, because I struggled with this book. ASIDE from the fact that its only written from Holly's POV, I found myself not following what was going on at points, becuase there is reference to things that happened before, and I didn't know what that was. I KNEW that Blade was rejected by Callie, I KNEW there was history between Tristan and Blade, and all the other little bits that came through, I just couldn't put it all in place. I got a bit lost with Holly's mother, and all the hints and snippets that came through, again, I couldn't put it all together in time for the book to finish! There is a MASSIVE supporting cast, huge number of people, just dropped in along the way. HUGE!! Most of them, after looking at the other books, are from those books. As I said, told ONLY from Holly's POV, in the first person. Not my favourite, as you all know! This is my first Kristen Strassel book and this series looks like its going to be a really interesting one. The main character in the story is Holly Octane, who works at the Le Cirque Macabre, she bursts into flames five nights a week, her audience loves her, and she feels alive on the stage, she can travel through time and ignite's into flame. And I found this to be a very interesting concept for a Paranormal Heroine. Holly lives with her aunt and her fortune teller girlfriend, Rainey, who also works at the Circque De Macabre in the stalls, but she has been having visions that are disturbing her, as they don't include Holly, she knows things are going to change. Holly is about to be knocked off the top spot at Le Cirque Macabre, by Cash Logan a Vampire magician, but even he has an ulterior motive, he introduces Holly to a vampire that has the power of fire. Cash want's Holly to help Blade learn to control his fire, Rainey leaves, and the attraction between Holly and Blake ignites, then other outside forces come into play that will cause Holly's future to change drastically. Will Rainey's vision come to pass, what is the connection between Cash and Holly? I have to admit I went blindly into reading this story so I didn't have any crazy expectations. Having never read anything previously by Kristen Strassel I wouldn't know what to expect anyway lol but this book was a pleasant surprise. The Fire Dancer was like Water With Elephants meets Dracula. The story lured me in from beginning to end and I found myself unable to put this down. It's been a while since I've read a PNR or Urban Fiction book so it was refreshing to read this book full of vampires, witches, seers, and bleeds. Holly's story is mesmerizing and you will totally find yourself rooting for her throughout the book. There may be times when you find yourself rooting for different alliances but you can't help but fall under the spell that these vampires cast. The immediate pull toward Blade is palpable and I can't wait to see where things go with these two. Cash is in a league all his own and I admit I think he had me mesmerized a time or two. I cannot wait to see where this story leads and if they will, in fact, burn the city down! Job well done! Highly recommend for the PNR and urban fiction lover. Holly Octane performs in Le Cirque Macabre as she has the ability to create and catch on fire. She has no real idea of who she is, how old she is or even what she is….she just knows she can catch on fire and also has the ability to travel back in time. Enter Cash Logan, powerful vampire who believes he is a magician, and he needs Holly. Blade Bennett is a newly created vampire and the first of his kind that can manipulate fire (fire is a killer for a vamp) but he cannot control it…..this is where Holly Octane performs in Le Cirque Macabre as she has the ability to create and catch on fire. She has no real idea of who she is, how old she is or even what she is….she just knows she can catch on fire and also has the ability to travel back in time. Blade Bennett is a newly created vampire and the first of his kind that can manipulate fire (fire is a killer for a vamp) but he cannot control it…..this is where Holly comes in as his mentor. Holly and Blade together are a powerful and ‘hot’ (get it!) combination. ‘You’re the only place I fit’. This book is brilliantly written and is told from Holly’s POV, finding out who she is, making new relationships, losing some and ultimately righting wrongs. I think my favourite line was when Holly was explaining Cash’s new relationship to her friends : ‘Cash singled her out as his next on stage kill so I am not sure how she is going to want to update her relationship status on facebook’!!! Reviewed for Book Fancy Book Blog. I haven’t read all the books in The Night Song Collection, the only one I have read was Silent Night and I absolutely loved it. Being that I don’t real A Lot of vampire books, I wasn’t sure how I would feel, but Kristen Strassel is a fantastic writer that creates an amazing story. The same goes for Fire Dancer, which is a spin off from the Night Song Collection. This books was full of twist and turns that I never saw coming, I still unsure what was true and what was an illusion and who Holly can I haven’t read all the books in The Night Song Collection, the only one I have read was Silent Night and I absolutely loved it. Being that I don’t real A Lot of vampire books, I wasn’t sure how I would feel, but Kristen Strassel is a fantastic writer that creates an amazing story. The same goes for Fire Dancer, which is a spin off from the Night Song Collection. This books was full of twist and turns that I never saw coming, I still unsure what was true and what was an illusion and who Holly can really trust. Since the book is solely from the POV of Holly, the reader doesn’t really know what is going on until Holly does. This is also a very dark world of vampires, another series I read the vampires are helping each other move to a better world. Where these vampires want to dominate and be the best/strongest ones. I still have plenty of questions that have been unanswered and I cannot wait for the next book to see what happens to Holly and the rest of these interesting characters. If you're a fan of Kristen's Night Songs Collection, you will love this spinoff story. Holly was brought in as part of that whole vamp war and ended up performing her scorching fire dance at Le Cirque. She can control fire. Well she's learning how to anyway. Then Cash comes into her life. Now you might remember this mysterious magical vamp and I for one couldn't wait to learn more about him. He is one of those characters that you aren't quite sure is a good guy or a bad guy. For most of this sto If you're a fan of Kristen's Night Songs Collection, you will love this spinoff story. Holly was brought in as part of that whole vamp war and ended up performing her scorching fire dance at Le Cirque. She can control fire. Well she's learning how to anyway. Then Cash comes into her life. Now you might remember this mysterious magical vamp and I for one couldn't wait to learn more about him. He is one of those characters that you aren't quite sure is a good guy or a bad guy. For most of this story he is walking that fine line. He needs Holly to attract Blade. You may remember Blade as the dumped boyfriend turned crazy vamp who wants revenge. When Holly and Blade get together they are combustible...literally. Holly isn't quite sure what her place is in this whole deal between Cash and Blade. She does know that she loves being on stage performing. The rest ends up being a bit of a mess and I loved every minute of it. I can't wait to see what happens next. I really wanted to love this book. When I read the synopsis, I had to sign up for the tour and review. The plot was decent, but I felt I was missing a lot of backstory. The whole time traveling threw me off some also. I didn't feel any sort of connection with any of the characters, which is very rare for me. Holly Octane is a fire dancer in Vegas. She's not human, she is a Bleed. We do find out more about her through out the book. I did like her job and found that interesting. Holly wants love. S I really wanted to love this book. When I read the synopsis, I had to sign up for the tour and review. The plot was decent, but I felt I was missing a lot of backstory. The whole time traveling threw me off some also. I didn't feel any sort of connection with any of the characters, which is very rare for me. Holly wants love. She is missing that. She allows people to use her in order to gain their love. Even Rainey doesn't love her for who she is, she wants her to change. At Le Cirque Macabre, Holly Octane bursts into flames five nights a week and the way this story describes this I would pay to see it. Be prepared for oh so much more than he performance at Le Cirque Macabre as she has many other special talents. This story and the characters are unique. As the story progresses Holly discovers who she is, discovers her family and meets another like herself. Not only does the story involve Le Cirque Macabre but a band and vampires. The vampires in this book don't g At Le Cirque Macabre, Holly Octane bursts into flames five nights a week and the way this story describes this I would pay to see it. Be prepared for oh so much more than he performance at Le Cirque Macabre as she has many other special talents. This story and the characters are unique. As the story progresses Holly discovers who she is, discovers her family and meets another like herself. Not only does the story involve Le Cirque Macabre but a band and vampires. The vampires in this book don't glitter and some of them bring harm to others. I like the uniqueness of all of the characters. Each character will pull you into the story and you will want to learn more about them. Some you will dislike and others you will fall in love with. This in unlike any vampire or Paranormal book I have read before and I highly recommend it if you like a story with great characters, non stop action, surprises and twists and turns you won't see coming. 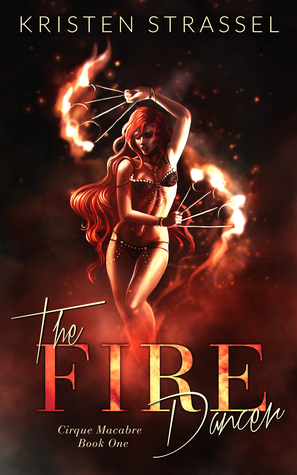 Holly is learning to control the fire within her, she is a fire dancer at the Cirque Macabre. Holly is a 'bleed' and immortal she meets Blade, a new vampire, who is also learning to deal with the fire. Holly needs to find herself by looking into her past, what will she find and who can she trust ? Holly Octane is the Fire Dancer, she is the hottest girl in Sin City. The Cirque Macabre is becoming as necessary to her as breathing. The adulation of the crowd makes her feel special. That same thing that makes her dancing so incredible, makes everyday life nearly impossible. When a famous vampire comes to take over the show Holly finds herself losing the person who has always been there for her, and not being able to control her life at all. I received this ARC for a honest review. I started this book and was excited to read this but after getting half way through it, I just lost it. The characters were good and the writing was spot on but the storyline didn't flow well. Too many hands in the pot. a Bleed. She is immoral and that extends to all directions. She is curious to find out what happened to her mother but that search also explains who her father is. Then we have Blade who is another I received this ARC for a honest review. I loved this new twist on Strassel's vampire lore. We see a lot of familiar faces, including Blade, my favorite character, from Because the Night. We get to see another side of him in The Fire Dancer. But this is Holly's story, and her powers take us through time. She's a creature that I've never seen before, she's sassy, and she's not afraid to go for what she wants. Pick this one up for a fast paced and (at times) horrifying read. i loved Holly's story. it goes back and gives you a different view than you got in the night songs collection. i cant wait for the next one. This is my first introduction to this author. I really enjoyed reading this book, even though I didn't feel a connection to anyone but the heroine. Holly has an unusual "talent." It fits right in to the Vegas strip. She can somehow exude fire. Not like a dragon, but more like a human torch. Of course this is not a safe talent to have. Especially when it can be triggered by strong emotions. Holly has had a pretty sucky life, and since she was born in 1781 that is not a good thing. She has one oth This is my first introduction to this author. I really enjoyed reading this book, even though I didn't feel a connection to anyone but the heroine. Holly has an unusual "talent." It fits right in to the Vegas strip. She can somehow exude fire. Not like a dragon, but more like a human torch. Of course this is not a safe talent to have. Especially when it can be triggered by strong emotions. Holly has had a pretty sucky life, and since she was born in 1781 that is not a good thing. She has one other strange ability, she can visit any other time and place she wants to go. She has learned that she can also change the time line if she is not careful, sometimes she is not careful. Cash Logan is a old vampire. For some reason she and her mismatched "family" have been waiting for him to come to her in Vegas. He has his own reasons for seeking her out. One of them is another vampire, Blade, that also has the power of fire. Blade has less control over his fire than Holly does. Cash hopes they can help each other control the flames because he has big plans for Blade. Another character in this story is Holly's "sister" Rainey. Rainey can see the future, anyone's future. Well anyone except vampires. If they are involved she can see nothing. This is not helpful when one is surrounded by them and their future is Intertwined with your own. I will let you read the story for yourselves. Some of the characters are from a previous series that I hope to read so that I can feel a connection to them. It is not required that you have read that series, obviously, but I am sure it will enrich the experience of reading this one. (The Night Songs Collection). Kristen Strassel is far cooler than she’ll make herself sound in this bio. She enjoys spending time with the voices in her head—nudging the characters toward those bad decisions and a happily ever after. When she’s not writing, she’s often still in the land of make-believe—doing makeup for film and television. And when she’s not doing any of that, she enjoys making her house look like a Pinterest Kristen Strassel is far cooler than she’ll make herself sound in this bio. She enjoys spending time with the voices in her head—nudging the characters toward those bad decisions and a happily ever after. When she’s not writing, she’s often still in the land of make-believe—doing makeup for film and television. And when she’s not doing any of that, she enjoys making her house look like a Pinterest board, watching football, and road trips to the middle of nowhere. Come backstage! Join my reader group and get all the news first!